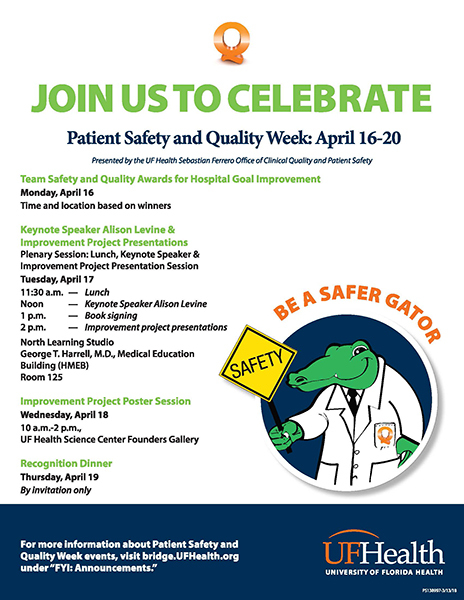 April 3, 2018 — Our 2018 UF Health Patient Safety and Quality Week is April 16-20. UF Health continues to demonstrate a strong commitment to patient safety and quality improvement — and this is the time for faculty, staff, residents, students and volunteers to participate and learn more. The week’s events provide unique opportunities for us to share information about hospital quality goals, recognize top contributors and innovators, increase awareness of hospital-wide quality improvement projects and celebrate achievements in patient safety and quality. Mark your calendars and watch for details surrounding the week’s planned activities. Visit the Quality & Patient Safety site to learn more.